Over a decade ago, a few EM employees from Asia gathered at the Prayer Mountains in Seoul to pray for God to raise a community of believers in EM who can bring about significant changes for His glory. 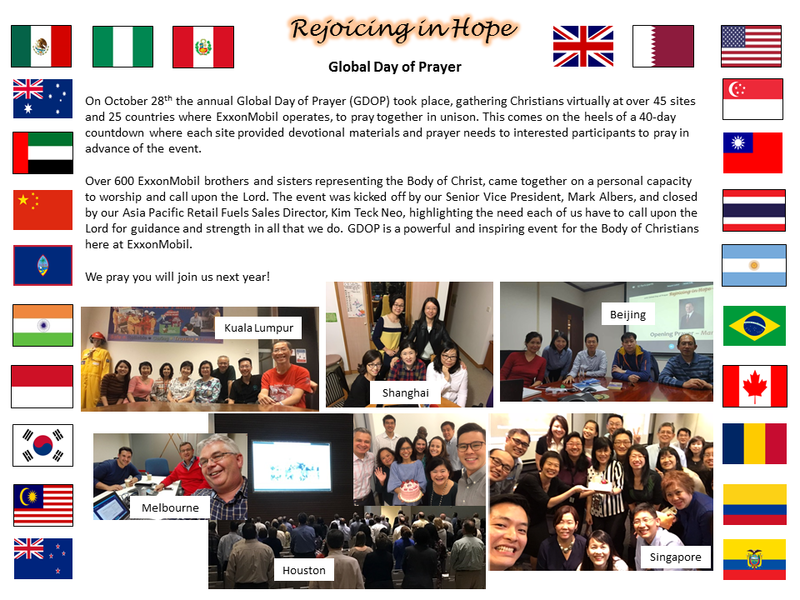 This was the birth of GDOP, an annual event where Christian communities in 40+ ExxonMobil sites, 25+ countries gather virtually to pray in unison after a 40-day countdown with sharing of devotional materials and prayer needs from various sites. Join us again for 2018 GDOP on the theme “Trust Him First”. Campus Calendar Entry: Click here (intranet link). Hughes Landing Calendar Entry: Click here (intranet link). SEE YOU AT THE POLE day is on Wednesday, September 26, at 7:00 a.m. local time. All around the globe, in every time zone, students will be gathering at their flagpoles, praying for their school, friends, families, churches, and communities. We as CCEM will be joining to pray for our community. SEE YOU AT THE POLE is a day committed to global unity in Christ and prayer. Meet at the Energy Center Flag Pole at 7 am. Global Day of Prayer 2016 !! !